I've tasted variety of lumpia because my Mom used to experiment almost everything to make lumpia out of the many kinds of food available. Mom has done lumpiang shanghai, togue, tuna, lumpiang tuna, assorted veggies, corned beef and many others but she didn't cooked us a dish like the one above. 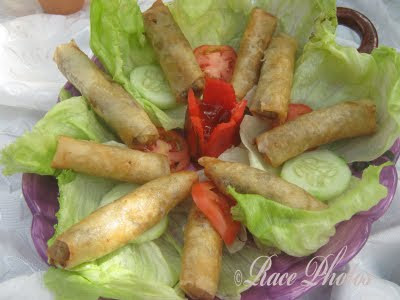 The picture was one of the presented nutritious food for the Linggo ng Wika and it's called Banana Heart Lumpia. The menu together with banana heart burger won the first place. See other yummy foods here! I went to supermarket yesterday to buy some house essentials and replenish our food stocks. I’m doing it weekly now unlike before when I was working that I buy groceries semi-monthly. It’s easier to stock food weekly and economical too. Anyway I was surprised at the crowd that greets me when I entered the supermarket. It was late in the afternoon and maybe some office employees have already withdrawn their salaries for the pay period. That should explain the unexpected crowd I met. I should have made it earlier because I was also in a hurry. I waited in line and been watching how the barricades have been so effective in controlling the people in line when a fast approaching lady went directly in front of me not minding the queue of people behind her. She apologized suddenly when we stared at her and plead to be attended first because she was in a hurry, who isn’t? I was expecting that the stanchions would be a sign to everyone to be disciplined in waiting in line. I surmised not all people can really follow rules and regulations 100%. I’m disappointed because I like everything in order and in control. I was thinking that perhaps there should be a sign that will somehow manage crowd control as some people can’t follow what the barriers were trying to imply to people. Signs are as important as stanchions, barricades and velvet rope in controlling crowds. It can be an added reminder to those who doesn’t care to wait for their turn. But generally all of it is a great help in guiding people on where to wait in line and in managing people who are crowding themselves in line. 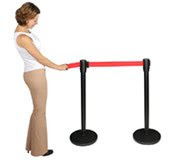 It’s even better if they visit Camelback’s crowd control products which showcase various helpful products in public guidance like velvet rope, security and traffic barricades, safety and crowd barriers, stanchions and all of Lavi products. Supermarkets, banks and other establishment that usually entertains crowd should check out their site to choose from their range of quality products. When you travel, you want to experience the journey as much as the destination. You want a vacation that really immerses you in a culture.